Wouldn’t it be nice to live in a comfortable cottage, tucked away from the stresses of the modern world? While it may not be possible to live in a cottage in the woods, it is possible to give your home the same cozy look with cedar shake roofing! Cedar shake roofing is an exceptional way of bringing a more traditional look to your home, giving it an “old world” look and feel that many homeowners love. 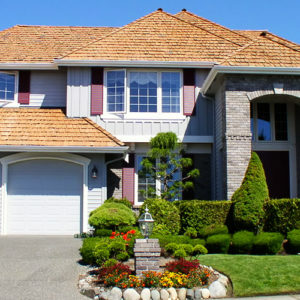 Cedar shake roofing is known for its irregular shape and texture, giving every home a distinct character. This provides your home with a “handmade” look, setting it apart from modern homes, which tend to be more uniform. Of course, maybe you want your home to have a old fashioned appearance without giving up the symmetry of modern roofing. For those customers, John Beal recommends “shake perfect,” as it is called: a shake that is cut into a uniform and standardized shingle. This can be a great compromise for homeowners looking to get the best of both worlds! While called cedar shake, this roofing material is actually offered in a variety of premium woods. The list of possibilities includes pine, cypress, redwood, and western red cedar. Cedar just happens to be a favorite among many of John Beal’s customers, as it has a light and attractive appearance that looks great on a variety of different styled homes. While cedar is known to begin as a soft shade of red, over time it will age into a silvery gray. Cedar is perfect for roofing because of the benefits of the material itself. Cedar is quite durable for a wood, offering natural protections against water, so it’s less likely to rot or mold than other woods. Of course, because cedar roofing is still made of wood, rot and mold are still more likely than with other materials. Cedar shake requires routine maintenance that can be taxing to some homeowners, who may prefer their roof to be more self-sustaining. With proper installation and routine care, most issues can be avoided, with cedar shake lasting the same amount of time as your average shingle: around 20 to 30 years. If installed improperly, or if cheap materials are used, this roofing material may become incredibly problematic. This is why choosing a qualified roofer can be so important! Because cedar shake is a type of wood, most are unrated for fire safety codes. It goes without saying that wood is a flammable material, though some manufacturers will wipe or spray their shakes with a fire retardant. This can prove effective in the short-term, but this coating will naturally wear off over the course of a few years. Other varieties of cedar shake or shingle are pressure-treated, with fire retardants pressed directly into wood. This is much more effective than a simple coating, so some of these products will meet national fire safety standards. One of the disadvantages of cedar shake is its cost. Not only does it tend to be more expensive per unit, it will also need to be replaced with a greater frequency that some of the other premium roofing solutions. Maintenance will also require a degree of expense, though, for many homeowners, the expense is well worth the rich beauty that cedar shake has to offer.